Johny Setiawan takes a walk through the Indonesian National Museum and reflects on the shared heritage of Malaysia and Indonesia. At Anthropology.net, we hear more about the recent discovery of the genetic mutation that might explain homo floresiensis. Monkeysmooth visits the heritage-endangered site of Ayutthaya. The Thai Art and Archaeology blog writes about recent excavations at Thung Kula Ronghai. While this French site has some pictures of the bas-reliefs in Angkor Wat. 21 June 2007 (Jakarta Post) – Have you visited your museum lately? If you’re in Indonesia, you’ll have no less than the president exhorting you to visit the museum! President Susilo Bambang Yudhoyono was encouraging Indonesians to visit their museums. It’s interesting to see how museums are now seen as cultural repositories of the past, particularly in the context of post-colonial Southeast Asia. The concept of the museum evolved from the desire to showcase “acquisitions” from the worldly travels of the European elite. This concept is somewhat different in the Southeast Asian context: more often than not, they initially began as a showcase of acquisitions by the former colonial masters to exhibit the exotic in the colonized lands; and in more modern times museums in Southeast Asia have played an important part in “recapturing” the exotic, and using it to develop and define the national identity. For example, it is no accident that the article mentions exhibits from the Majapahit empire, as the Majapahit is considered the height of ancient Indonesian glory. The celebration of past glories is a common motif in museums elsewhere in Southeast Asia: Malaysia has the Malacca Sultanate, Thailand has Ayutthuya and Myanmar has Pagan. This gives museums a political role in defining what national identity is, a definition controlled by the ruling power. Of course, as the postcolonial states of Southeast Asia begin moving into industrialization and globalization, the role of museums have once again become slightly altered: a source of economic revenue. Because the value of history and heritage are impossible to quantify, tourism, and in particular heritage tourism, have become the new space for museums to reside, and grow, in an increasingly capitalistic world. The article also notes the (insufficient) cost of running Indonesia’s 287 museums, where money is needed to not only run, but promote its museums and must thus become treated as economically viable ventures. Expressing his concern over the public’s lack of interest in visiting museums, President Susilo Bambang Yudhoyono encouraged people Wednesday to visit museums to learn from the wisdom of the past. “Let us relive the past glory and pride to build Indonesia to become a developed, advanced and prosperous state. From museums we can learn to appreciate differences and become more tolerant,” Yudhoyono told the opening ceremony of the Gedung Arca (Statue Building) at the National Museum. The president said Indonesia had to be more creative in expanding economic alternatives such as eco-tourism and heritage economics to survive in the future. He said museums, as repositories of the nation’s cultural heritage, could be a new economic resource in the future. 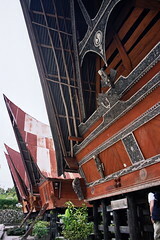 Read more about Indonesia’s museums. Here are two websites I found on the archaeology of Indonesia. They are also added to the resources page, which has a long list of links to other sites relevant to the archaeology of Southeast Asia. The first site is written in Bahasa Indonesia, which may pose a problem to English-speaking users. The Museum Nasional Indonesia’s website is also a little confusing, but if you explore it deep enough there are guides to the collections in the museums.